Welcome on our site which we did in tribute to Mercedes G Class car in military version „WOLF”, till now produced by the Austrian company PUCH for a German Army needs. Mercedes „Wolf” perfectly suited for both daily driving and weekend trips to the countryside. In Europe the car is bought mostly by hunters, off-road enthusiasts, farmers, veterinarians and those living in geographically challenging environments. It provides an excellent base for all kinds of alterations in the so-called „Funcar’s” or as a working car. Due to the continuous production of the Mercedes G remain virtually unchanged for over 30 years, the overall availability of spare parts, the puritanical nature and incredible reliability; it is undoubtedly one of the best cars in the world. „Wolf” does not have any amenities, electronic systems and various types of fancy that when driving in extreme conditions often fail. 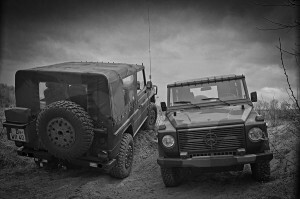 In times of extreme weather events and the many conflicts in different parts of the world seems to be indispensable to have a vehicle that you can fix the „hammer and wire”, which can be supplied even with vegetable oil, and which after 17 years of service in the army does not lose but it gains the value. Interesting fact: The German Bundeswehr has paid in the early 90′s over 40 thousand DM (around 22 thousand euros) per Wolf in the basic version – now the price with about 1000km mileage is well over 20 thousand. EUR and is still growing. Cars offered by our company comes from the German army, that puts a lot of emphasis on the regularity of maintenance and care of its machinery, which means that the customer receives the vehicle in perfect condition and suitable for further use or possible alteration.